01/18/2016: Added trademark table, added a OTC O-2428 Tappet Wrench. 04/19/2011: Added a OTC H-183 1/2-Drive Speeder. 01/10/2011: Added a OTC Early 15/16x1-1/16 Offset Box Wrench. 01/02/2011: Added a OTC RB-2428 Ratcheting Box Wrench. 12/22/2010: Added a OTC C-22 Combination Wrench. 10/16/2010: Added a OTC F-1820 Flex-Box Wrench. 09/23/2010: Added a OTC B-12 Obstruction Wrench. 06/25/2010: Added a OTC E-2225 Open-End Wrench. 09/13/2009: Added a OTC F-3032 Flex-Box Wrench. 03/22/2009: Added a OTC E3640 Open-End Wrench. 01/23/2009: Added a OTC 7051 Specialty Open-End Wrench. 12/07/2008: Added a OTC F2628 Flex-Box Wrench. 08/21/2008: Added a OTC E-1013 Open-End Wrench. 07/31/2008: Added a OTC H-187 1/2-Drive Sliding Tee Breaker Bar. 07/03/2008: Added a OTC H-260 3/8-Drive Rotating-Head Ratchet. 06/15/2008: Added a OTC No. 6 Ignition Wrench. 06/14/2008: Added a OTC No. 5 Ignition Wrench. 06/03/2008: Added a OTC Early 1/2-Drive Flex-Head Breaker Bar. 04/05/2008: Added a OTC 13/32x7/16 Short Box Wrench. 01/27/2008: Added a OTC No. 1002 Gear Puller. 12/31/2007: Added a OTC A-100 Valve Spring Lifter. 10/30/2007: Added a OTC Early No. 1001 Gear Puller. 10/23/2007: Added a OTC No. 1001 Gear Puller. 09/12/2007: Added a OTC Half-Moon Box Wrench. 06/25/2007: Added a OTC H-275 3/8-Drive Flex-Head Breaker Bar. 05/09/2007: Added a OTC C-36 Combination Wrench. 04/10/2007: Added an OTC P-61 1.5 Hex Drive Ratchet and an OTC P61-6 1.5 Hex To 3/4 Square Adapter Plug. 04/06/2007: Added a OTC 776 Brake Spoon. 04/03/2007: Added a OTC 1000 Gear Puller. 04/02/2007: Added OTC 714 Snap-Ring Pliers. 03/07/2007: Added OTC H-161 1/2-Drive Ratchet. 03/06/2007: Added OTC 614 Snap-Ring Pliers. 02/13/2007: Added patent table, added a OTC H-160 Rotating-Head Ratchet. 02/12/2007: Added a OTC MA-60 Single-Box Wrench. 02/06/2007: Added OTC Bent Longnose Pliers. 12/17/2006: Added page, not much content yet. The Owatonna Tool Company is an important tool maker best known for its pullers and presses. The Owatonna Tool Company (OTC) was founded in 1925 by Reuben A. Kaplan, an engineer and inventor who had previously worked for Truth Tool. The company took its name from its location in Owatonna, Minnesota. In 1927 OTC filed a trademark application for the "OTC" logo, a design with the central "T" rising above and partially covering the "O" and "C". The application listed the first use date as September 1, 1925, and the trademark was issued as #237,653 on January 17, 1928. Reuben A. Kaplan was listed as president of the company. The "Grip-O-Matic" and "Push-Puller" trademarks were registered with the first use in 1940. OTC [logo] 09/01/1925 08/15/1927 01/17/1928 237,653 Used for gear pullers, other tools. OTC [logo] 02/20/1944 02/18/1964 04/13/1965 788,115 OTC "Shield" logo. OTC [logo] 02/20/1944 08/31/1972 05/28/1974 984,906 OTC "Shield" logo. Product information was obtained from a number of OTC catalogs, as summarized in the table below. N/A 1925 Half Yes 23 pages. Lists Nos. 1, 2, and 3 gear pullers. Offers specialty tools, chisels, and punches. N/A 1926? Half Yes 31 pages. Lists Nos. 1, 2, and 3 gear pullers. Offers specialty tools, pliers, chisels, and punches. No. 20-A 1929 Half Yes Includes socket sets in 1/2 and 3/8-drive. No. 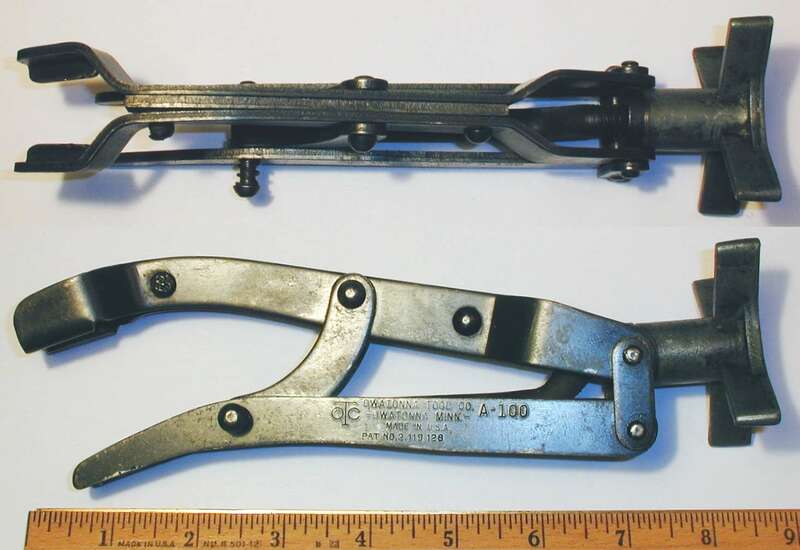 21 1930 Half Yes Includes open-end and tappet wrenches. 48 pages. No. 26 1935 Half Yes Full product line. No. 28 1936 Half Yes Sockets of hot-forged chrome-vanadium steel. No. 45 1945 Full Yes Includes Essential Service Sections. No. 47-J 1947 Half Yes Includes Essential Service Sections. No. 49-J 1949 Half No Includes Essential Service Sections. No. 55-B 1958 Full No Includes Essential Service Sections. No. P-9 1959 Full No "Industrial Maintenance Equipment". No. G-71 1971 Full No "Maintenance Tools and Equipment". Fig. 1. OTC No. 1000 Gear Puller. Fig. 1 shows the smallest of the many OTC "Grip-O-Matic" puller models, the OTC No. 1000 gear puller. The pressure screw is 4.0 inches long, the jaws is 2.7 inches long, and the yoke is 2.7 inches wide. The finish is plain steel for the yoke and pressure screw, and chrome plating for the jaws. 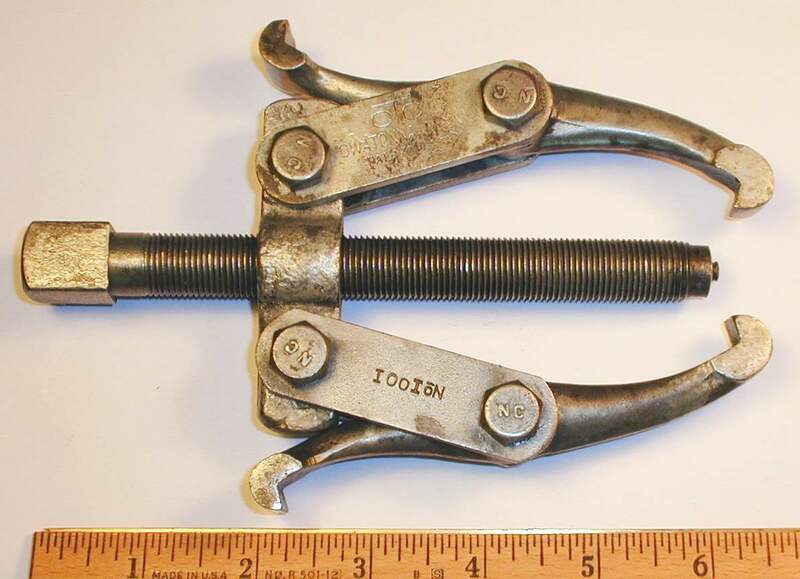 The "Grip-O-Matic" puller design is described by patent #1,709,913, filed by R.A. Kaplan in 1927 and issued in 1929. The next figures show two more examples of the OTC "Grip-O-Matic" line, both No. 1001 two-arm gear pullers, but with some differences in the construction. Fig. 2. OTC Early No. 1001 Two-Arm Reversible Gear Puller. Fig. 2 shows an early example of the OTC No. 1001 two-arm reversible gear puller, stamped "OTC Owatonna, Minn." and "Pat. 1709913" on one connecting plate with the model number on the opposite plate. The pressure screw for this early model is 7.1 inches long and has a 1/2-20 diameter and thread pitch. The yoke is 3.0 inches wide, and the reversible jaws are 4.8 inches long. The finish is cadmium plating. Fig. 3. OTC No. 1001 Two-Arm Reversible Gear Puller. Fig. 3 shows a somewhat later example of the OTC No. 1001 puller, stamped "OTC Owatonna, Minn." and "Pat. 1709913" on the connecting plate, with the model number stamped on the opposite plate. The pressure screw for this puller is shorter at just 6.0 inches long, and the diameter has been increased to 9/16-20 diameter and thread pitch. The yoke is 3.0 inches wide, and the reversible jaws are 4.8 inches long. The finish is cadmium plating. Fig. 4. OTC No. 1002 Two-Arm Reversible Gear Puller, with Inset for Marking Detail. Fig. 4 shows a larger example of the Grip-O-Matic series, an OTC No. 1002 two-arm reversible gear puller, stamped "Owatonna Tool Co. Owatonna, Minn." and "Made in U.S.A." on the connecting plate. The pressure screw is 8.9 inches long with an 11/16-18 diameter and thread pitch. The yoke is 4.3 inches wide, and the reversible jaws are 8.6 inches long. The finish is chrome plating. Fig. 5. OTC Early 9/16x5/8 Half-Moon Box Wrench. Fig. 5 at the left shows an early OTC 9/16x5/8 half-moon box wrench, probably intended for starter and manifold service. The wrench is unmarked except for the "OTC" logo. Fig. 6A. OTC Early 13/32x7/16 Short Box-End Wrench, with Inset for Side View. Fig. 6A shows an early OTC short box wrench in an unusual 13/32x7/16 size, marked only with the "OTC" logo. The overall length is 5.7 inches, and the finish is plain steel. Fig. 6B. OTC Early 15/16x1-1/16 Offset Box Wrench, with Insets for Side View and Marking Detail. Fig. 6B shows an early OTC 15/16x1-1/16 offset box wrench, marked only with the "OTC" logo. The overall length is 16.5 inches, and the finish is plain steel. Fig. 7. OTC F-1820 9/16x5/8 Flex-Box Wrench, with Inset for Top View. Fig. 7 shows an OTC F-1820 9/16x5/8 flex-box wrench, stamped "Owatonna Tool Co. Owatonna, Minn." and "Made in U.S.A." on the raised panel. The overall length is 9.7 inches fully extended, and the finish is cadmium plating. Fig. 8. OTC F-2224 11/16x3/4 Flex-Box Wrench, with Inset for Top View. Fig. 8 shows an OTC F-2224 11/16x3/4 flex-box wrench, marked "Owatonna Tool Co. Owatonna, Minn." and "Made in U.S.A." on the raised panel. The overall length is 11.0 inches, and the finish is plain steel. Fig. 9. OTC F-2628 13/16x7/8 Flex-Box Wrench, with Insets for Top View and Reverse Detail. Fig. 9 shows an OTC F-2628 13/16x7/8 flex-box wrench, marked "Owatonna Tool Co." on the raised panel, with "USA" on the reverse. The overall length is 12.3 inches fully extended, and the finish is chrome plating with polished panels and sockets. Fig. 10. OTC F-3032 15/16x1 Flex-Box Wrench, with Insets for Top View and Reverse Detail. Fig. 10 shows an OTC F-3032 15/16x1 flex-box wrench, stamped "Owatonna Tool Co." with the OTC logo on the raised panel, with "Made in U.S.A." and the fractional sizes on the reverse. The overall length is 14.3 inches fully extended, and the finish is chrome plating with polished panels and sockets. Fig. 11. OTC E-1013 5/16x13/32 Open-End Wrench. Fig. 11 shows an OTC E-1013 5/16x13/32 open-end wrench, stamped "Owatonna Tool Co." and "Owatonna, Minn." with "Made in U.S.A." on the shank. The shank also has a forged-in code "8740" visible at the left. The overall length is 5.0 inches, and the finish is chrome plating. Fig. 12. OTC E-2225 11/16x25/32 Open-End Wrench, with Inset for Reverse Detail. Fig. 12 shows an OTC E-2250 11/16x25/32 open-end wrench, stamped "Owatonna Tool Co." and "Made in U.S.A." with the OTC logo on the shank, with the model number and fractional sizes on the reverse. The overall length is 8.1 inches. The finish is chrome plating, with extensive losses due to wear. Fig. 13A. OTC E-3640 1-1/8x1-1/4 Open-End Wrench, with Inset for Reverse Detail. Fig. 13A shows an OTC E-3640 1-1/8x1-1/4 open-end wrench, stamped "Owatonna Tool Co." and "Made in U.S.A." with the OTC logo on the shank, with the model number and fractional sizes on the reverse. The overall length is 12.9 inches, and the finish is chrome plating. Fig. 13B. OTC O-2428 3/4x7/8 Tappet Wrench, with Inset for Reverse. Fig. 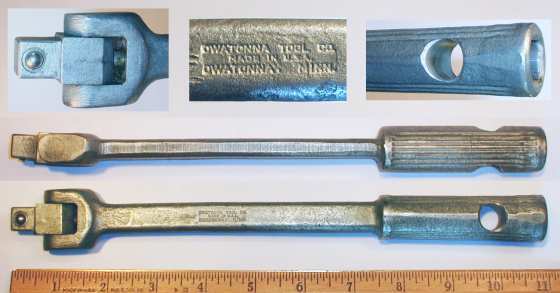 13B shows an OTC O-2428 3/4x7/8 tappet wrench, stamped "Owatonna Tool Co." and "Made in U.S.A." with the OTC logo on the shank, with the model number and fractional sizes on the reverse. The overall length is 9.4 inches, and the finish is chrome plating. Fig. 14. OTC B-12 3/8x3/8 Angle-Head Obstruction Wrench, with Inset for Reverse. Fig. 14 shows an OTC B-12 3/8x3/8 obstruction wrench, stamped with the OTC logo and "Chrome-Vanadium Steel" on the shank. The overall length is 5.5 inches, and the finish is nickel plating. Fig. 15. OTC No. 5 13/64x15/64 Ignition Wrench, with Inset for Reverse. Fig. 15 shows an OTC No. 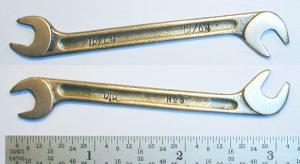 5 13/64x15/64 ignition wrench, stamped with the OTC logo and model on one side, with the fractional sizes on the reverse. The overall length is 3.1 inches, and the finish is nickel plating. Fig. 16. OTC No. 6 13/64x15/64 Ignition Wrench, with Inset for Reverse. Fig. 16 shows an OTC No. 5 13/64x15/64 ignition wrench, stamped with the OTC logo and model on one side, with the fractional sizes on the reverse. Fig. 17. OTC C-12 3/8 Combination Wrench, with Inset for Reverse Detail. Fig. 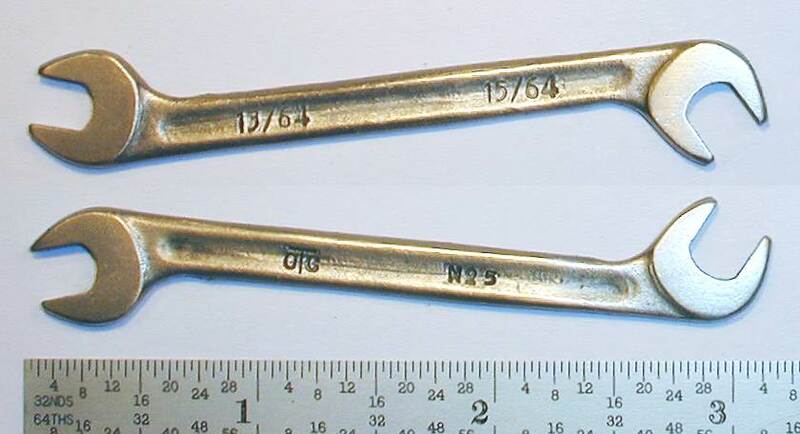 17 shows an OTC C-12 3/8 combination wrench, marked "Owatonna Tool Co" and "Made in U.S.A." with the OTC-Shield logo. The overall length is 7.0 inches, and the finish is chrome plating with polished faces. Fig. 18. 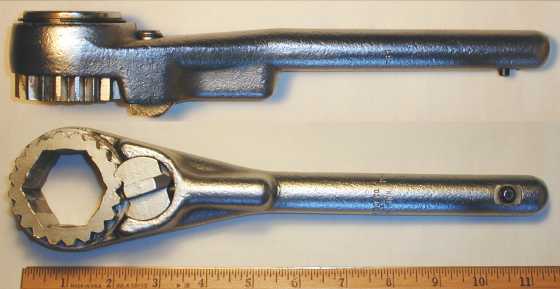 OTC C-22 1-1/8 Combination Wrench, with Inset for Side View. Fig. 18 shows an OTC C-22 11/16 combination wrench, stamped "Owatonna Tool Co." and "Owatonna, Minn." with "Made in U.S.A." on the shank. The overall length is 8.6 inches, and the finish is plain steel. Fig. 19. OTC C-36 1-1/8 Combination Wrench, with Inset for Side View. Fig. 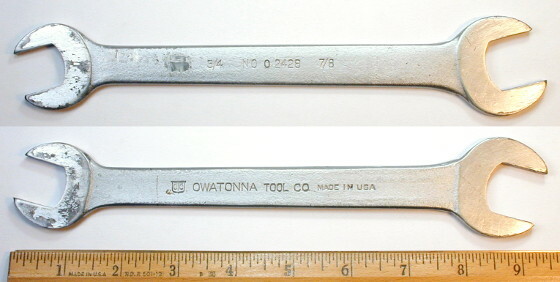 19 shows an OTC C-36 1-1/8 combination wrench, marked "Owatonna" and "USA" with the OTC logo. The overall length is 15.9 inches, and the finish is chrome plating with polished faces. Fig. 20. OTC RB-2428 3/4x7/8 Ratcheting Box Wrench, with Insets for Side View and Reverse Detail, ca. 1947-1950. Fig. 20 shows an OTC RB-2428 3/4x7/8 ratcheting box wrench, stamped "Owatonna Tool Co." and "Made in U.S.A." with the OTC logo on the front, with "Pat. App." on the reverse. The overall length is 9.2 inches, and the finish is chrome plating. 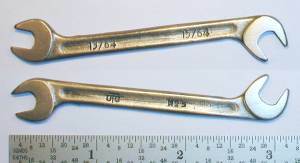 The top inset shows the laminated and riveted construction of the wrench, allowing the maker to be identified as A&E Manufacturing, a major producer of ratcheting box wrenches from the 1950s onward. The pending status refers to patent #2,500,835, filed by John W. Lang in 1947 and issued in 1950. Fig. 21. OTC MA-60 1-7/8 Single-Box Heavy Duty Wrench, with Inset for Marking Detail. Fig. 21 shows an OTC MA-60 1-7/8 single-box wrench, with markings "Owatonna Tool Co. Owatonna, Minn." and "Made in U.S.A." stamped on the shank. The overall length is 13.6 inches, and the finish is plain steel. The round shank is equipped with a push-button locking pin to engage an extender handle. Fig. 22A shows a 1/2-drive OTC H-183 speeder, stamped "Owatonna Tool Co. Owatonna, Minn." and "Made in U.S.A." on the end piece. The overall length is 15.8 inches, and the finish is cadmium plating. Fig. 22. OTC H-187 1/2-Drive Sliding Tee Handle, with Insets for Marking Detail. Fig. 22 shows a 1/2-drive OTC H-187 sliding Tee handle, stamped "Owatonna Tool Co. Owatonna, Minn." and "Made in U.S.A." on the sliding head. The overall length is 10.0 inches, and the finish is cadmium plating. Fig. 23. OTC [41-H-1500] 1/2-Drive 10 Inch Flex Handle, with Insets for Side View and Detail, ca. 1941-1945. Fig. 23 shows a 1/2-drive OTC 10 inch flex handle produced for a military tool kit, stamped "Owatonna Tool Co. Owatonna, Minn." and "Made in U.S.A." on the shank. Although not marked with a model number, the tool was identified as the "41-H-1500 Handle" illustrated in publication ORD 6 SNL G-27, a catalog of the "Tool-Set, General Mechanics'" from the WWII era. The overall length is 10.8 inches, and the finish is cadmium plating. The handle is equipped with a cross-bar hole and has a 1/2-drive end broaching, allowing use as a Tee-handle or extension. The lower inset shows a side view of the tool, clearly illustrating the trimming marks left by the drop-forge trimming operation. The fairly rough finish was appropriate for a tool being made for a military tool kit, as the emphasis was on high-volume low-cost production. The full description for the tool in the ORD 6 SNL G-27 catalog is "HANDLE, socket wrench, hinged, 1/2 in. sq-drive.,length 10 1/2 in. ", and the catalog shows a $1.15 unit price. Fig. 24. OTC H-161 1/2-Drive Ratchet, with Inset for Side View. Fig. 24 shows a 1/2-drive OTC H-161 ratchet, with markings "Owatonna Tool Co. Owatonna, Minn." and "Made in U.S.A." stamped on the shank. The overall length is 11.3 inches, and the finish is plain steel. Fig. 25. OTC H-160 1/2-Drive Rotating-Head Ratchet, with Insets for Marking Detail, ca. 1935+. Fig. 25 shows a 1/2-drive OTC H-160 "flex" ratchet with a distinctive rotating head, stamped "Owatonna Tool Co. Owatonna, Minn." and "Made in U.S.A." on the shank. The overall length is 11.9 inches, and the finish is cadmium plating. This unusual style of flex-head ratchet allows the head to rotate through 360 degrees, providing the flexibility to operate at any angle in tight places. 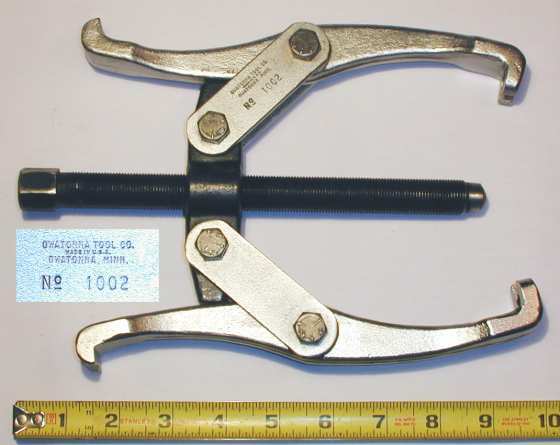 The OTC catalogs called these "Flex Ratchets", and models of this type (in 3/8-drive as well) were offered as early as 1935 in OTC catalog No. 26. Although this model was offered at a relatively early date, the design borrows from the even earlier Cunha 1919 patent, shown as the Peerless Wrench Cunha Patent Ratchet. Fig. 26. OTC H-260 3/8-Drive Rotating-Head Ratchet, with Inset for Side View. Fig. 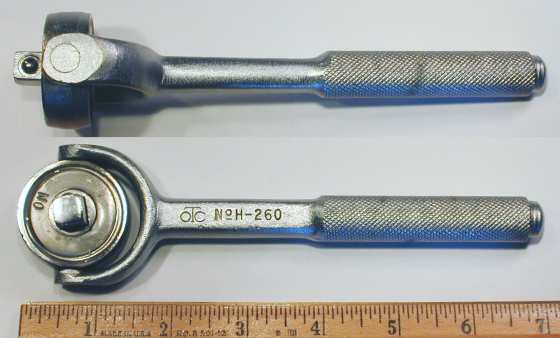 26 shows the 3/8-drive version of the rotating head ratchet, an OTC H-260 flex ratchet stamped with the OTC logo. The overall length is 7.0 inches, and the finish is chrome plating. The ratchet mechanism has a 24-tooth drive gear and uses dual pawls for greater strength. The ratchet action can be reversed by pushing the drive stud through to the other side. As with other OTC ratchets, the ratchet head has been permanently sealed by crimping the edges. Fig. 27. OTC H-275 3/8-Drive Flex Handle, with Inset for Marking Detail. Fig. 27 shows a 3/8-drive OTC H-275 flex handle, marked with the OTC logo on the shank. The overall length is 8.3 inches, and the finish is plain steel. Fig. 28. 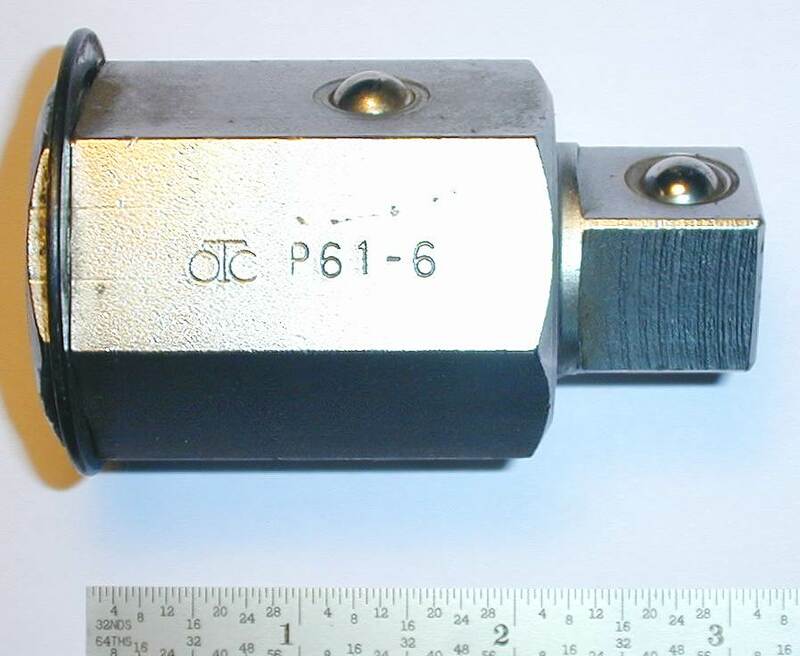 OTC P-61 1.5 Hex Drive Ratchet, with Inset for Side View. Fig. 28 shows an OTC P-61 1.5 hex drive ratchet, marked "Owatonna Tool Co. Owatonna, Minn." and "Made in U.S.A." on the shank. The overall length is 11.3 inches, and the finish is chrome plating. The P-61 is a heavy-duty ratchet intended for several applications. The 1-1/2 hex opening can be used directly on the hex nuts for some large OTC pullers. In addition, with a suitable adapter the ratchet can be used with 3/4-drive and 1 inch drive socket sets. Fig. 29. OTC P-61-6 1.5 Hex To 3/4 Square Adapter Plug. Fig. 29 shows one of the adapters available for the P-61 ratchet, an OTC P61-6 drive adapter going from 1.5 hex to 3/4 square drive. The adapter is marked with the OTC logo and model number. The overall length is 3.0 inches, and the finish is chrome plating. Fig. 30. OTC Bent Longnose Specialty Pliers, with Insets for Side View and Jaw Detail, ca. 1935. Fig. 30 shows a rarely-seen pair of OTC bent longnose specialty pliers, constructed with a groove in the tip for handling pins and wires. The overall length is 7.9 inches, and the finish is polished steel. The lower inset shows a closeup of the jaws, with a matching groove in each side to help handle small cylindrical objects. These pliers were listed in OTC catalog No. 26 from 1935, and were available in both straight and bent-nose styles. Fig. 31. OTC 614 Snap-Ring Pliers. Fig. 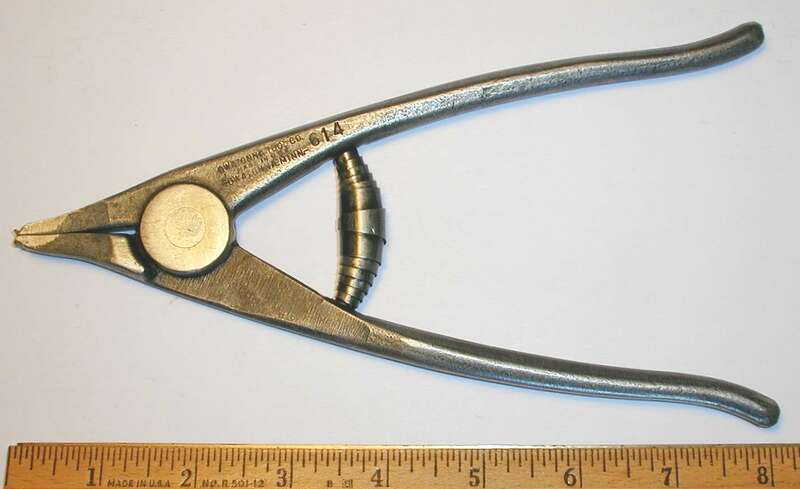 31 shows a pair of OTC 614 snap-ring pliers, marked "Owatonna Tool Co." with "Owatonna, Minn." and "Made in U.S.A." on the handle. Fig. 32. OTC 714 Snap-Ring Pliers. Fig. 32 shows a pair of OTC 714 snap-ring pliers, marked "Owatonna Tool Co." with "Owatonna, Minn." and "Made in U.S.A." on the handle. The overall length is 7.2 inches, and the finish is plain steel. Fig. 33. OTC 776 Brake Spoon, with Inset for Side View. The overall length is 7.0 inches, and the finish is plain steel. Fig. 34. 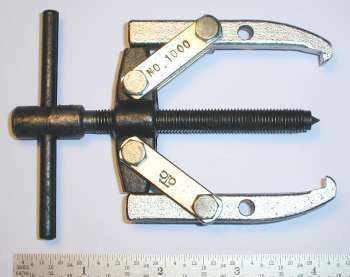 OTC A-100 Valve Spring Lifter, with Inset for Side View. Fig. 34 shows an OTC A-100 valve spring lifter, stamped with the OTC logo and "Owatonna Tool Co. Owatonna Minn.", plus "Made in U.S.A." and a "Pat. No. 2,119,128" patent notice. The patent notice refers to patent #2,119,128, filed by I.J. Clark in 1937 and issued in 1938. 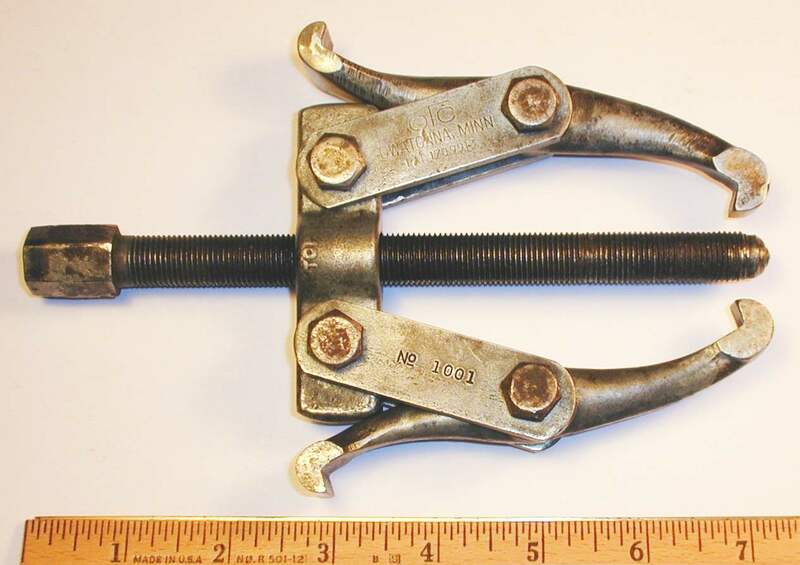 This patent was used by other tool makers as well as OTC, and an example can be seen in the Herbrand VL-540 Valve Spring Lifter. Fig. 35. OTC 7051 1-3/8x1-1/2 Open-End Wrench. Fig. 35 shows an OTC 7051 1-3/8x1-1/2 open-end wrench, stamped with the OTC logo on the raised panel. The overall length is 9.9 inches, and the finish is chrome plating.